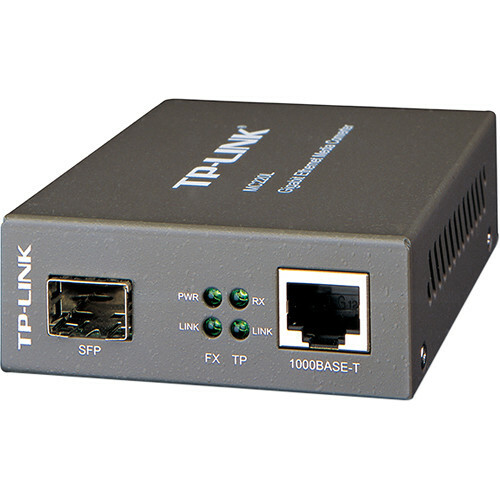 Convert 1000BASE-SX/LX/LH fiber to 1000Base-T copper media or vice versa with the MC220L Gigabit SFP Media Converter from TP-Link. This media converter supports the 802.3ab, 802.3z, and 802.3x network standards and extends fiber distance up to 0.3 miles using 50/125um fiber. In addition to extending the transmission distances up to 0.3 miles, the MC220L Media Converter also supports data transfer rates of up to 1000 Mbps in Full-Duplex mode for both TX and FX ports. Installation is simple as this device comes equipped with a single Gigabit SFP port, a single Gigabit Ethernet port, and an external power adapter. Box Dimensions (LxWxH) 8.031 x 6.535 x 2.284"